Move on over gold and silver. There's a new American Eagle coin on the block. 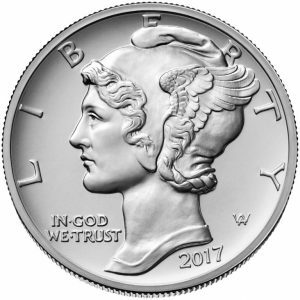 For the first time, the United States Mint began offering a one-ounce American Eagle Palladium bullion coin in late September. The new coin is designed to offer investors an easy and cost-effective way to invest and hold physical palladium. Those investing in precious metals are well aware of the value and properties around gold, silver and maybe even platinum. But, palladium? What is this under the radar metal? 1. Palladium is a precious metal and industrial metal. Palladium is used widely in pollution control devices for gasoline powered cars and trucks. That makes the new American Eagle a great diversification tool in the precious metals arena. 2. Palladium is the biggest gainer in the commodity universe in 2017. The price of palladium surged an incredible 34% (through Oct. 7) since the start of the year. That's more than double the return of the S&P 500 this year. Palladium demand is forecast to rise to 10.13 million ounces in 2017, surpassing the 10 million ounce mark for the first time since 2014. That means the new palladium American Eagle arrived at the right time. There is huge investor interest in this metal. 3. The price of palladium scooted past platinum recently for the first time since 2001. Last week, spot palladium hit a high at $946.00 an ounce. That compares to $921.00 an ounce for spot platinum. Demand has been rising for palladium, while demand for platinum (jewelry and components for diesel powered vehicles) has slid. See current spot prices here. That means current prices of the new palladium American Eagle could be a bit rich. Should you snap up this new palladium coin? From a diversification perspective it is a smart move. Just as you diversify your equity portfolio from large cap stocks to international stocks, with a few value stocks and dividend stocks thrown in the mix. The broader diversification you have in the physical precious metals arena, the better. Patience could be a virtue. For coin investors who'd like to add palladium to their portfolio, consider this. Sometimes when a market rallies excessively, it becomes overstretched, overvalued and vulnerable to a snap-back correction. That could be the case now for palladium, according to well-respected metals consultancy CPM Group. "Platinum near rock bottom, palladium on the edge of a cliff," the CPM Group report said. new investors that have entered this market, attracted by the healthy and sustained rise in prices. . . Many of these investors are likely to leave the palladium market just as quickly as they got into the market," the report said. In the meantime, current levels may offer one of the best buying opportunities in platinum seen in years. Platinum is another precious metal that benefits from both industrial demand and investment demand, and also has a long history of being used in coins for currency. Platinum – and also palladium are widely used in industrial applications including automobile manufacturing. Both of these metals exhibit qualities, such as durability, resistance to corrosion and catalytic properties that make them heavily used in industry. Learn more the benefits of investing in physical platinum here. Investors can and should diversify their tangible assets portfolio with diversification across metals types through purchases of a mix of gold, silver and platinum, and palladium coins, bars and bullion. Right now, platinum, may offer an excellent long-term buying opportunity. Platinum bullion U.S. Eagles, produced by the U.S. Mint, are minted in a variety of denominations. Contact Blanchard today at 1-800-880-4653 and a portfolio manager can identify investments that are the best fit for you.